Another great week of fishing! Aaron and Michael (top left) caught their limit of catfish out of Lake 2 on mackerel and shrimp. Troy (top right) caught this largemouth out of Lake 5. Ryder (bottom left) caught this largemouth out of Lake 5 on a nightcrawler. Sheila (bottom right) caught this catfish out of Lake 7 on mackerel. Join us October 6th and 7th for our annual Stockzlilla event! 3,500 pounds of catfish will be stocked and distributed throughout all 7 lakes! Tagged fish and surprise giveaways all weekend! 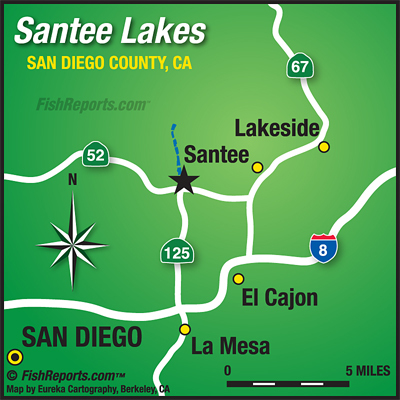 No California state license required only a Santee Lakes fishing permit. The topwater bass bite has picked up recently due to the colder nights. Popular topwater baits to use have been buzzbaits, spooks, and the whopper plopper. The catfish bite seems to pick up more towards the late evenings. There have been many reports of catfish being caught on mealworms and mackerel.